Daily Spirit & Word, 469: How to get your Glory-Glow. Come Up To The Mountain Top. How to get your Glory-Glow. You’ve heard of Mountain-Top Experiences right? They are the moments in life when we’re overjoyed with something; it might be landing that dream job, getting pregnant, having a baby, getting engaged to your dream girl, your wedding day or the day you left college with a qualification. Each one of us has had at least one moment in life when we felt elated, full of high-spirited delight and it’s a truly awesome feeling. Moses was invited to get ready early in the morning to climb up the mountain and be with the Lord. You know my friends, we’re invited too; every day we can get up early, get ready and climb up the mountain to be with the Lord. We don’t know how Moses felt, but we can imagine, however, we do know that Moses was not the same when he came back down the mountain, because he shone with the glory of the Lord. Moses got his glory glow. You’ve received a Mountain Top Invite From The LORD. How? How do we climb up a mountain when we live in the City or on the flat plain? How can I climb up the mountain when I’ve got five kids to look after? How can I climb up the mountain when I’m getting ready to go to work? Oh my friends; if we were invited by our favourite artist, actor, singer or sports hero to come and spend some time with them, how eager would we be to be ready? to be there on time? to get as close to our favourite personality as we possibly could? I’d love to meet some of the ‘Stars’, but we must be careful what we wish for. Once, whilst attending a Christian Conference in London at Westminster Hall, it was glorious and awesome. We’d been singing in the morning for about an hour; praising and worshipping the Lord, and then being fed with God’s word for over two hours. As we walked around the corner to look for a place to have some lunch you’ll never guess who I literally bumped into? It was my favourite comedian from the 1970’s, every time he walked onto the stage on TV I’d be rolling around the floor laughing, I love and laughed at his every move. To me he was just so funny, tears of joy would stream down my face watching him perform. And I longed to meet him to watch him live. Well here he was, I’d bumped into him. He was shorter than I imagined, he stank of booze and was unshaven, he could hardly string a sentence together and I felt so sorry for him. My STAR had faded, but he was still a human being, just a human being. His name? I’ll save him embarrassment for now. It was already a habit of mine to get up early in the morning to be with the Lord, but now after that Conference and meeting my fallen hero, I was convinced that my eternal hero, my joy and delight was waiting for me every single day, and Jesus would enthral, enchant, enrapture me far more than anything the world could ever offer. So for me, going out into the garden or the woods whilst it’s still dark to pray and walk with the Lord, then come back and praise Him and get into His Word is like Moses encounter on the Mountain Top: Except I can do it every single day, not matter where I am or what I’m tasked with doing that day. If I’ve got a lot on on any particular day, I’ll get up to be with the LORD even earlier. Why? Because once you start meeting with Jesus in the mornings, you’ll never really want the sun to come up. You’ll want those precious mountain-top moments to last for ever, but time ticks, the sun rises and the day approaches and we reluctantly leave the Master’s presence, but full of JOY and ready to face the day with our Glory Glow shining for the world to see. 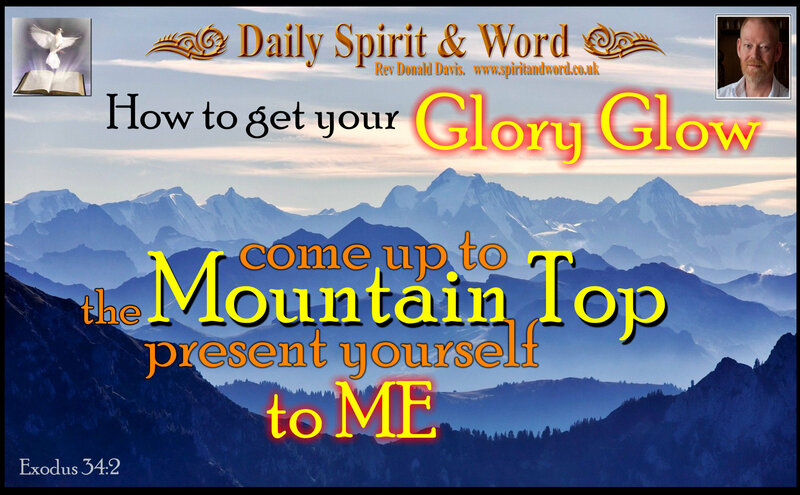 This Mountain Top Invite is for you today, to come and meet with Jesus, meet with Him every day, to be filled with His presence and to know Him and experience the JOY He desires for your life, He’ll give you the Glory Glow. Will you come? Will you come and worship the Lord on the Mountain Top? Do it on the bus, on the train, in the car or as you walk to work. Come up to the mountain top and experience the fullness of LIFE Jesus wants for you. As you praise Him, your Heart is going to be filled with His glory and you’ll come down from your Mountain Top just like Moses; radiant with the glory of the Lord. He got his glory-glow from being with the LORD and you will too my friends. It may not be obvious to everybody, but you’ll be transformed into the likeness of the Lord. You may also wish to visit my NEW PAGE: Discover The Spirit Filled Life. Have an truly AWESOME Tuesday on the Mountain-Top with the LORD. You may like to sing along with these fantastic worship songs today: 10000 Reasons, This is my desire, Lord I give you my heart, To Be In Your Presence. How to Get Your Glory Glow? “Come Up To The Mountain Top and Present yourself to ME” says the LORD.